odious as many of UKIP’s supporters are, corrupt as its leadership indubitably is, dishonourable and dishonest as its message, leadership and staff are and risible as their results were. Fortunately NEVER have they had anyone even near to being elected to an office considered as of any stature in these United Kingdoms having been reliant on the protest votes of those outraged by dishonesty at Westminster and indifferent to the systemic and endemic near industrial corruption of UKIP as it is in the EU. As a result UKIP would seem to have less individuals elected to office in Britain than thee and me have fingers – astonising when one realises there are around 30,000 offices they WANT to be elected to! The accrimonious recriminations of the vile UKIP supporters who having failed YET AGAIN seek out almost anyone to slander but being the greatest failure in UK politics it seems that internal Civil War has become the order of the day as the lynch mobs turn on the Pearson / Farage pact that betrayed UKIP to their Tory Masters. The truelly embittered failures desparate to hang onto unwarranted income lash out in pointless spleen sheltering their cowardice behind their troll internet anonimity. 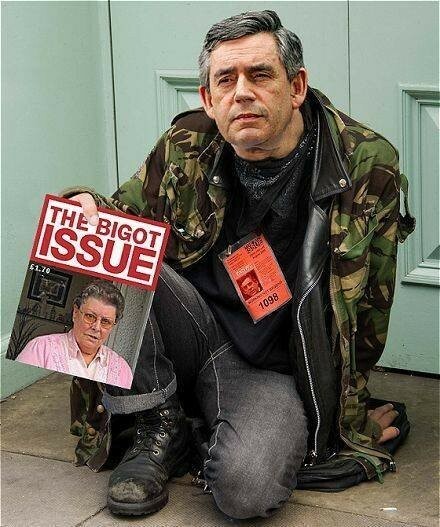 Gordon Brown may be vile, he may have been a crook, he may even have deliberately betrayed these United Kingdoms but he has more honour and integrity than UKIP’s leadership and the anonimous ttrolls who try to prop them up by seeking to belittle and defame men and women of integrity who have displayed their principles and put their name to them. Previous Previous post: #G284* – URLs TO HELP YOU! WOOPS Sorry:10foot x 3.5foot corex UKIP sign! Hi,BG some of our ancestors were prepared to give their lives for our right to vote and many were prepared to die to obtain and defend our basic human right of self determination within the law as free and sovereign peoples of these United Kingdoms – largely for that reason I do not believe I have the right to abrogate upon my duty to honour those sacrifices by witholding/abstaining from voting. Nor do I believe I have a right to squander that hard fought right by being other than honest – even in the privacy of the ballot.You comment on the difficulty, yet does that not overlook the sacrifice others made?Do join in discussion of this and other 'principles' at:http://www.Leave-the-EU.blogspot.comon the left sidebar you will find a FORUM – nascent but a worthy place to refine such issues ;-)Regards,Greg_L-W.